Mark down your calendars. The 14 of June Sip and Shop Fair is just around the corner. Everyone wants to be unique in a way. Why not expressing your uniqueness through a perfectly tailored piece of clothing from Airess, a stunning jewel from Anthea Cooper, a new quirky home decoration from Dovetail Living? 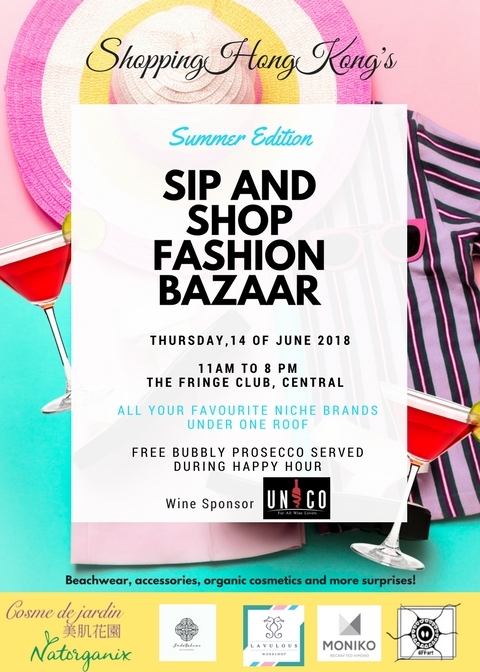 These and many other brands offering organic skin care products, kimono recrafted handbags, tasty nibbles and much more are joining together to make our Summer Sip & Shop at the Fringe Club an unmissable shopping event! We can’t wait to celebrate the Summer Season with some fabulous Shopping! Are beer shorts and popsicle molds with built-in straws gonna help you survive Hong Kong Summer heat? Next PostNext Are beer shorts and popsicle molds with built-in straws gonna help you survive Hong Kong Summer heat? Copyrights © 2018 ShoppingHongKong. All Rights Reserved.